So it’s International Women’s Day today. I took this as an excuse (and the fact that it was raining WAY too much to walk to the library on the other side of campus and actually get some work done) to spend my morning in bed watching a documentary on Netflix called “She’s Beautiful When She’s Angry”. (TOTALLY recommend; homework is overrated, go and watch amazing women standing up for themselves!) Needless to say that one post will not be enough to sum up the message, one post will not even even be enough to make a big statement about feminism or anything. But it could be enough to make some of you think about something, about the first major step we girls can take. A step we have to take. Every time I scroll through instagram and one of those awesome Female Collective posts comes up on my feed I feel inspired. And proud. I think: YES, this is it, this is great. Girls fighting back, girls taking control over their lives. Amazing!, and then I double-tap and keep on scrolling. I go and do some research and write an essay about the stigmatisation of black women, send it to my professor and forget about it because I also have to write another essay about something else, no time to look a bit further into it. The issue is this: I DO feel inspired, motivated to go and do something. To become active. But I DON’T DO anything. 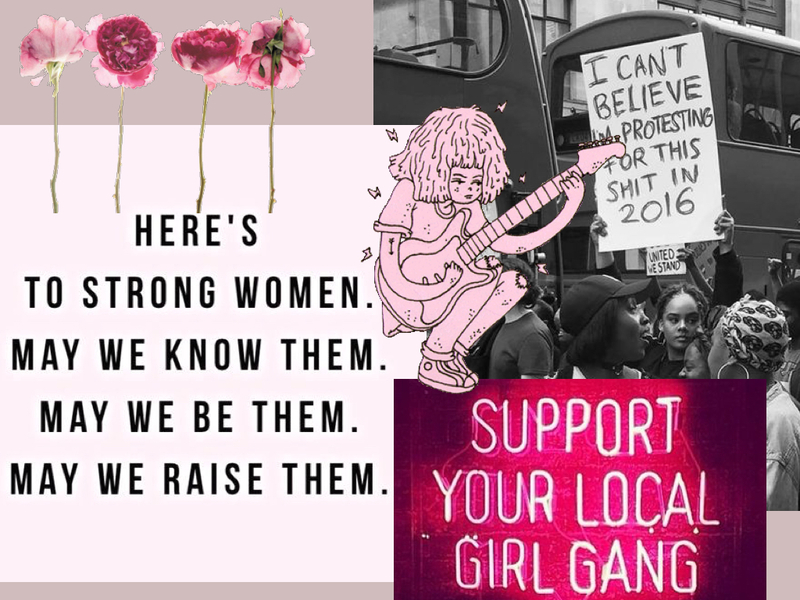 I double-tap powerful quotes and black and white photos of women holding up banners. I read some interviews with great feminists and the super inspiring book #GIRLBOSS by Sofia Amoruso (also definitely can recommend). But: THAT’S IT. And let me assume I am not the only one here. This is not (only) a call for all of us to start picking up where the feminists movements left in the 70s. It is a call to do one simple step that can have major consequences: Girls, stop being insecure. Stop feeling like you’re not enough! Stop CRITICISING your body and stop comparing yourself to other girls. Honestly, STOP!! I truly believe that our lack of self-esteem, our lack of love for ourselves is stopping us from uniting, from getting what we want. 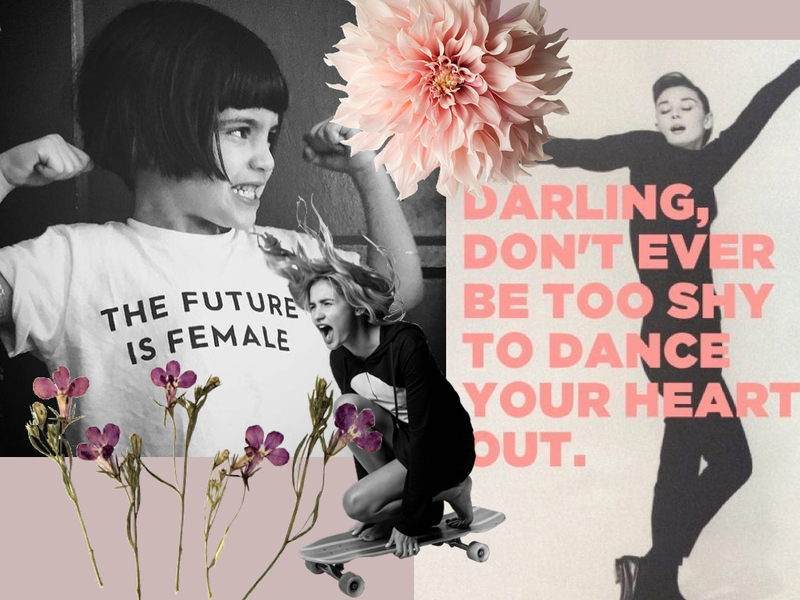 We need confidence, we need girls who know they’re amazing. Who know they’re absolutely great and powerful and can reach anything they want. And most importantly: we need encouragement. We need girls who compliment each other, who tell each other how beautiful they are. Girls who love themselves and others and who are not afraid to show that. Because self-confidence and pride is not only empowering us girls but it is intimidating those who try to bring us down. So keep your head up high! Wear whatever you want to wear, because WHO CARES. Put on those fake lashes or go without any makeup. Feel beautiful and strong. Speak up in class, say what you want to say. Go and talk to whoever you want to talk to. Post whatever you want to post. Stop caring what they think (because usually that is pure jealousy of your confidence and their lack of it). Once you realise how powerful it is to believe in yourself, how powerful it is to be your own boss you will automatically become that person you always admired. And lift others up on your way to the top. This is the first step. What follows self-confidence is self-respect. And that is followed by respect for others, and by coming together and uniting. I absolutely love seeing the women’s movement rising again, all triggered by one man gaining the power he was not supposed to have gained. Women all around the world are starting to (re-)create a new identity, a new movement, inspired by the women’s liberation of the past century. It’s time we pick up on that. It’s time to make this identity lasting and not temporary. And even if you’re stuck in uni, spending each and every day writing on your essays or studying for exams that is no excuse to not take that one simple but so incredibly powerful step. So this is my challenge for you: go and do something today you are afraid to do. Go and pretend to be that girl you admire. That powerful, self-confident, proud girl. ‘Fake it ’til you make it’. And believe me: you’ll get there. Once it’s in your mind it’s only a matter of time until it becomes reality. And if we stick to this attitude, if we use it as a stepping stone we can create something much bigger than self-confidence and a world full of girl bosses. Disclaimer: OBVIOUSLY this message does not only go out to all the girls here, it goes out to everyone. Self-confidence and respect is not restricted to any gender so go and compliment not only your girls but also your guys. And everyone else. Feminism is not about women only, it’s about all genders! You are so right, my lovely Clara! Keep up your pace!